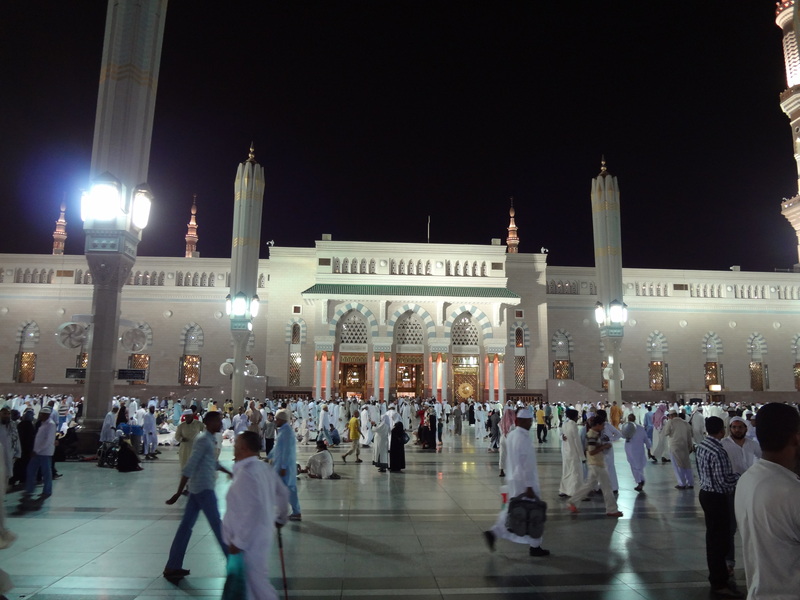 During my stay in Jeddah, I visited Madinah a number of times. This city, the city of prophet Muhammad (peace be upon him), has huge significance for Muslims. Though Islam originated from Makkah, however it was Madinah which provided a base to early Muslim community and became their stronghold. It’s the second sacred place for Muslims after Makkah. Madinah is around 400 km away from Jeddah. On highway, cruising at speed of 120 km/hr, usually it takes 4 hours or less to reach Madinah. Most of times, I used to leave for Madinah on Thursday noon. I did the same for today’s trip. The surroundings of whole way are barren lands and mountains. At one place in the way, the land is completely covered with black small stones which seems very uncommon. Just like something has burnt the area, which is of course, not the actual reason of black stones. 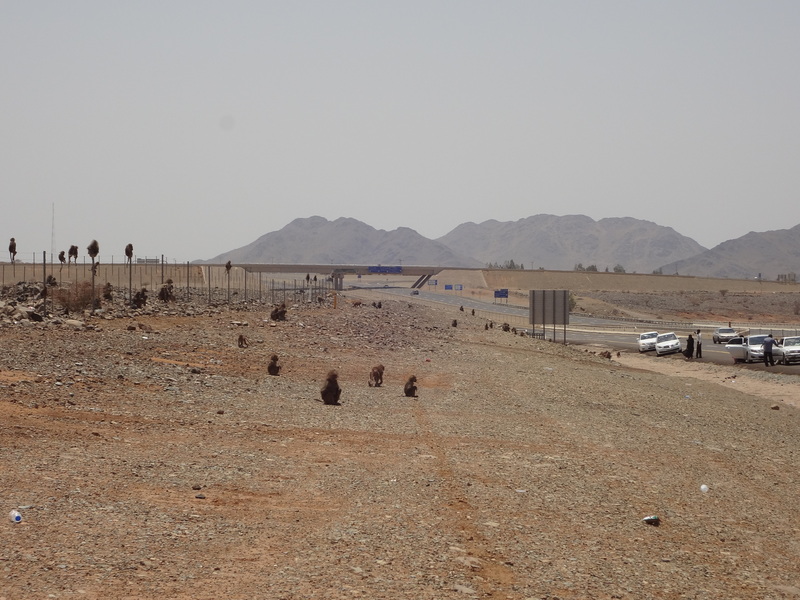 Approximately at midway to Madinah, there is a place where monkeys freely wander along road side. It’s strange to see monkeys at a place where trees are scarce. I don’t know what do they eat at such barren land? Usually families stop there for a while and kids get amused by watching monkeys. Monkeys along road side, approx. midway Jeddah to Madinah. I reached Madinah before sunset. After searching a hotel and putting my luggage there, I went straight away to Masjid-e-Nabawi (Prophet’s Mosque). 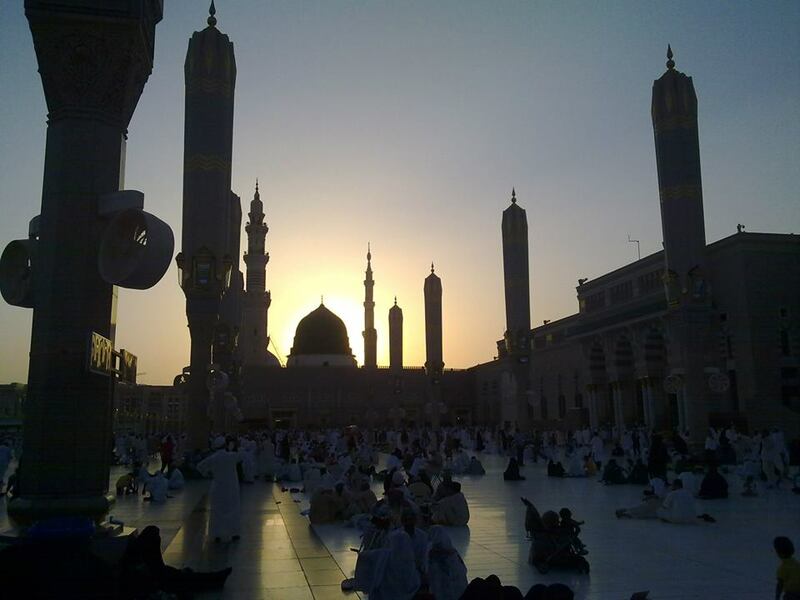 Sun setting behind dome of Masjid-e-Nabawi (Prophet’s Mosque). In order to offer farz prayers (daily five prayers) inside mosque building, one has to reach there at least half hour before the prayer timing in routine days or even one hour before prayer timing during month of Ramadhan or hajj days. I offered prayers in the vicinity of mosque and then headed towards roza-e-rasool (prophet’s grave) to say salam (peace). 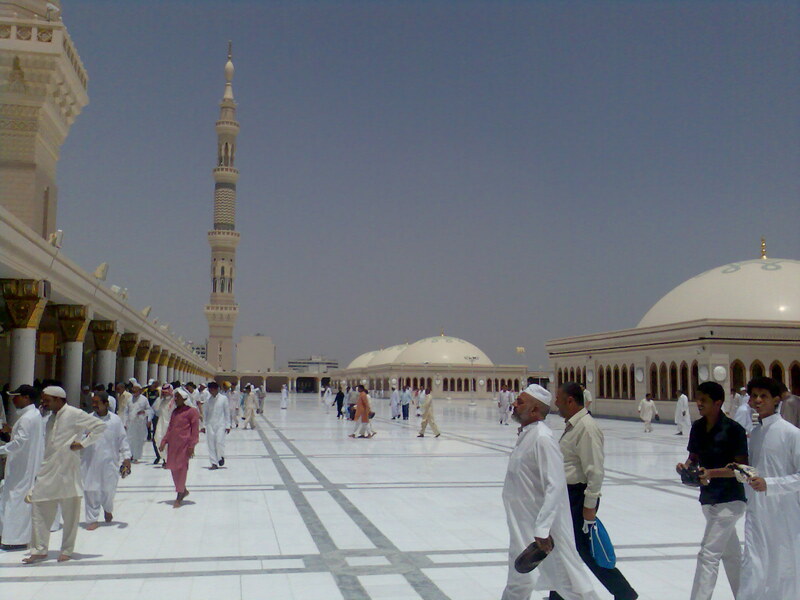 A front view of main entrance to Masjid-e-Nabawi (Prophet’s Mosque). 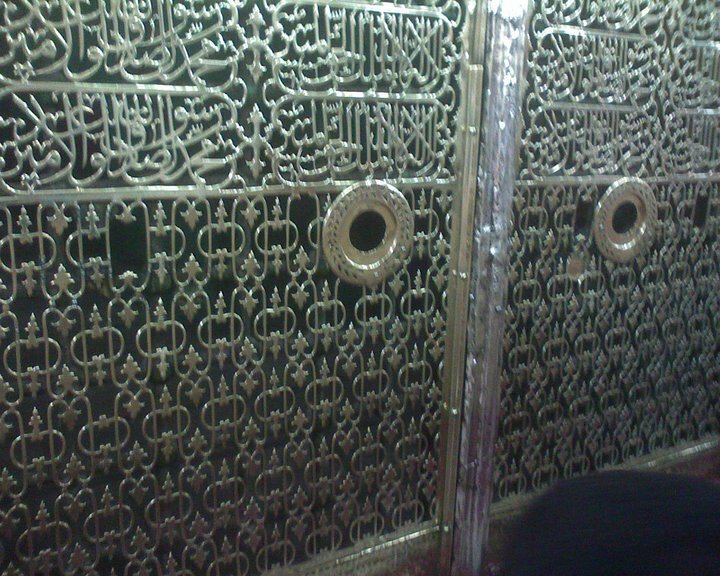 A close up of one of doors with Arabic carving “Muhammad Rasul Ullah” (means Muhammad, Prophet of Allah). 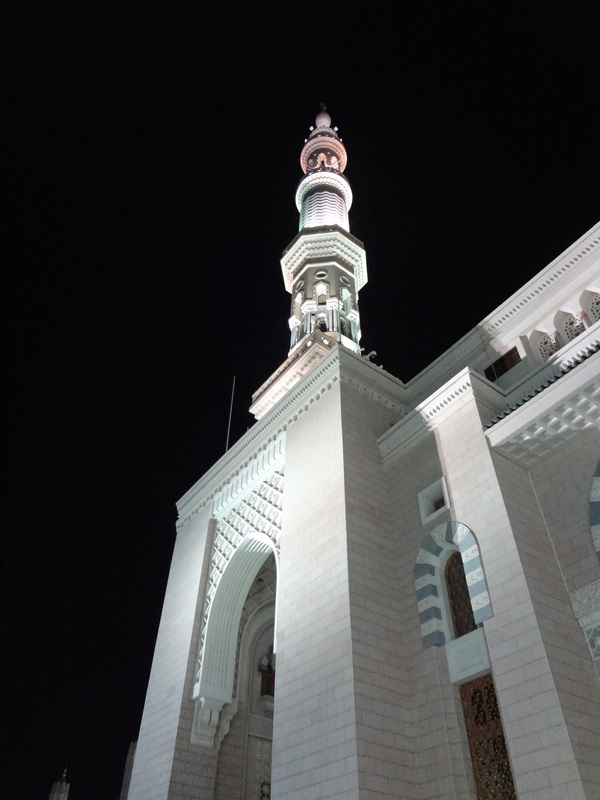 A minaret of Masjid-e-Nabawi (Prophet’s Mosque). An inside view of Masjid-e-Nabawi (Prophet’s Mosque). The two companions of prophet and first two caliphs Abu Bakr (Radhiallahu Anho) and Umar (Radhiallahu Anho) are buried next to prophet Muhammad (peace be upon him). The graves cannot be seen as they are behind golden mesh and curtains and its too dark inside dome to see anything. However their names are carved on golden mesh in front of their graves. The people enter from one gate in queue, say salam and leave from other gate. I also got in the queue while reciting durood & salam (specific phrases to compliment prophet Muhammad PBUH). When I reached the prophet’s grave, I said Assalam o Alaikum Ya Rasool Ullah (Blessings on you, O Allah’s Prophet Muhammad), Assalam o Alaikum Ya Abu Bakr (Blessings on you, O Abu Bakr RA) and then Assalam o Alaikum Ya Umar (Blessings on you, O Umar RA). Finally, I got out of mosque. The graves are behind this golden mesh. 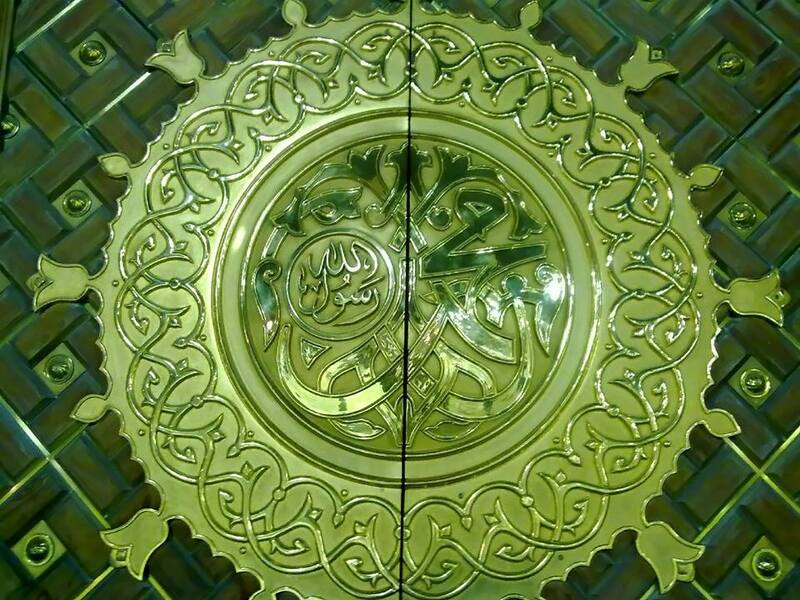 Green dome of Masjid-e-Nabawi (Prophet’s Mosque). I went back to my hotel to sleep. After praying fajr prayer (morning prayer) in mosque, I went to other historical and religious places in Madinah. At noon, I came back to Masjid-e-Nabawi to offer Juma prayer. I was a bit late. The mosque was full so I went to roof where it was less crowdy. 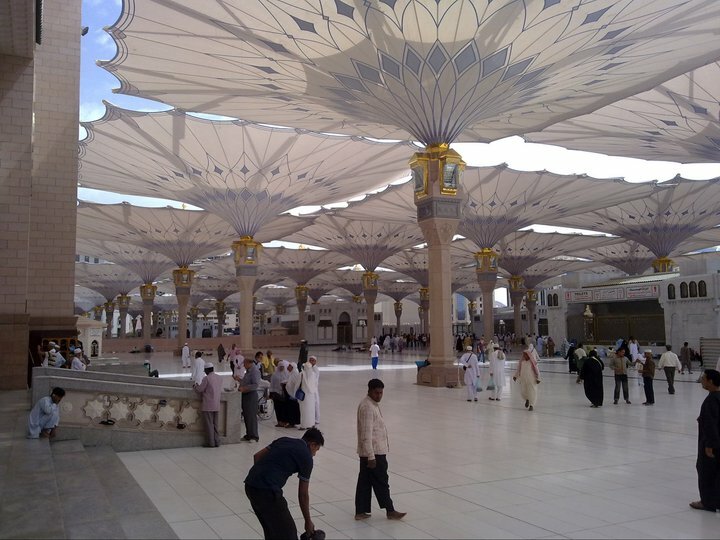 A view of Masjid-e-Nabawi roof. 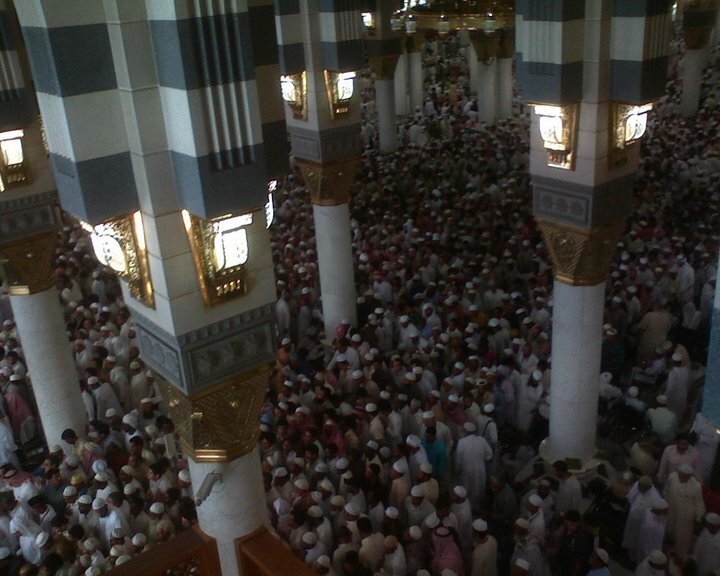 People leaving from Masjid-e-Nabawi after offering juma prayer. 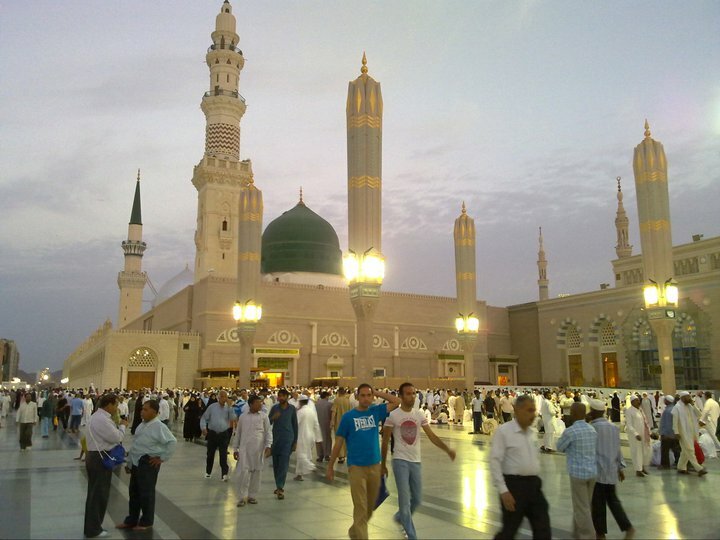 Madinah has severe weather, too hot in summers and too cold in winters. There are a number of umbrellas outside mosque which protect people from direct sunlight in summer. 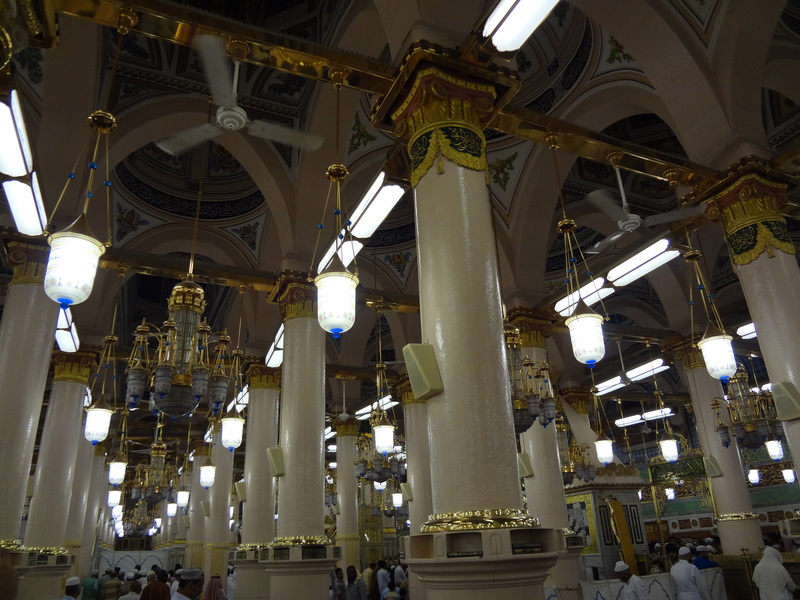 Electrically operated umbrellas in the vicinity of Masjid-e-Nabawi (Prophet’s Mosque). It was around asr prayer time (afternoon) when I left Madinah with the intention in mind to come back soon. It’s such a calm and peaceful place. May Allah’s mercy on prophet Muhammad (PBUH), his companions, all Muslims and whole humanity. Thanks. No it wasn’t cloudy. Perhaps its the reflection of ultra clean marble. Reading your post makes me feel as if I’m there in Madina! In the picture of Masjid-e- Nabawi roof was it cloudy?